Early 1996. With no progress on repatriation of the one million Hutu refugees to Rwanda, and with the former génocidaires among them continuing to launch cross-border attacks against Rwanda…local politicians in eastern Congo launch an ethnic cleansing campaign against Congolese Tutsis; President Mobutu supports the Hutus’ anti-Tutsi ethnic cleansing campaign; and the Tutsi-led Government of Rwanda repeatedly warns that it will intervene in the Congo if the attacks do not stop. Oct 1996. After 20 years in exile, the anti-Mobutu rebel Laurent-Désiré Kabila suddenly emerges in eastern Congo. He is now the leader of a new Congolese Tutsi rebel group, the AFDLC (Alliance des Forces Démocratiques pour la Libération du Congo-Zaïre / Alliance of Democratic Forces for the Liberation of Congo-Zaire. The AFDL rebellion seeks to prevent attacks on Congolese Tutsis by forcing the Rwandan Hutu refugees back to Rwanda, and to overthrow the Mobutu government—which garners support among many Congolese. With strong support from Rwanda, Uganda and Burundi, the AFDLC quickly takes control of a large portion of eastern Congo. President Mobutu is in Europe undergoing cancer treatment. Nov 1996. Violent anti-Mobutu protests erupt in Kinshasa. In the east, Kabila announces a unilateral 3-week ceasefire to allow desperately needed humanitarian aid to reach the one million Rwandan Hutu refugees in camps in eastern Zaire. Dec 1996. Brutal attacks by the ADFL rebels push as many as 700,000 Rwandan Hutu refugees back to Rwanda. Tens of thousands of Congolese citizens in the eastern region flee their home to avoid the fighting. Armed ‘Mai Mai’ groups (including “boy soldiers” as young as 12) emerge to defend their villages. Locals accuse the Congolese Army of looting and attacking them. President Mobutu returns briefly to Zaire. Many in Kinshasa welcome Mobutu’s return in the expectation that he will end the rebellion. Feb 1997. With remarkable speed, the AFDLC takes town after town and region after region, as the Congo Army retreats. Mar 1997. The AFDLC takes control of Kisangani, the Congo’s third largest city. 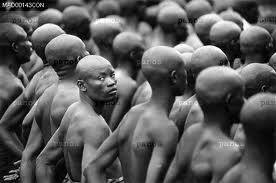 In Kisangani, the AFDL fighters force 20,000 Rwandan Hutu refugees out of their camps. Apr 1997. The Congo Parliament elects opposition leader Etienne Tshisekedi as Prime Minister (for his third time). Tshisekedi immediately annuls the constitution, dissolves Parliament and announces a new government (which he doesn’t have the authority to do), and offers six Cabinet seats to the ADFL rebels (who decline). 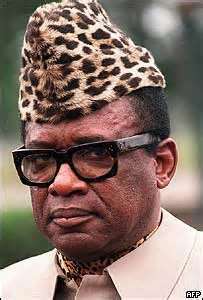 Mobutu fires Tshisekedi one week later. The ADFL awards a US$1 billion (or $2 billion?) mining contract to America Mineral Fields, which then gives the rebels $1 million (and perhaps as much as $50 million) as an advance payment. Well-financed and strongly supported by Rwanda, Uganda, and Burundi, ADFL takes control Lubumbashi, Congo’s second largest city and its main mining centre. Allegations surface of systematic AFDL massacres of Hutu refugees in Kisangani. May 1997. Tens of thousands of Rwandan Hutu refugees arrive on the western border of Zaire, having walked nearly 1000 miles across the country, fearing reprisals by Tutsi forces in eastern Congo and in Rwanda. President Mobutu returns to Kinshasa, then flees to neighbouring Republic of Congo along with his senior officers. Laurent Kabila is inaugurated as President. 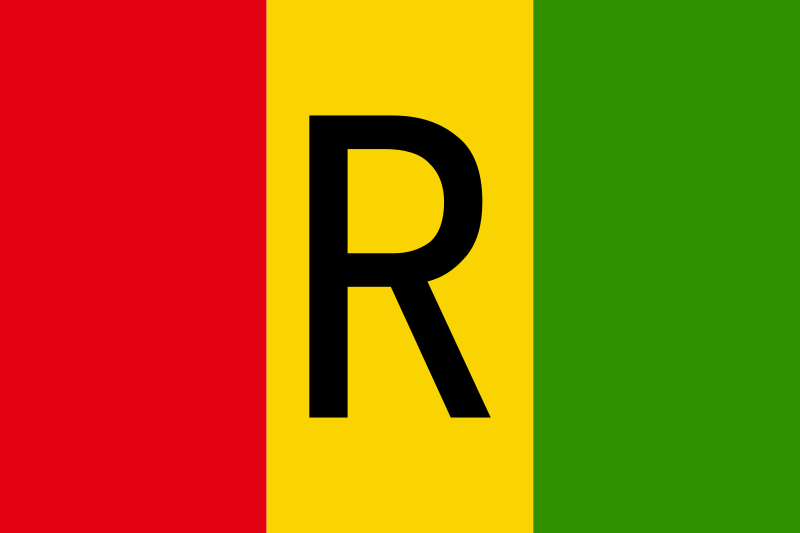 He renames the country, the Democratic Republic of the Congo—its name at independence in 1960. President Kabila promises a referendum on a new constitution by December 1988, and presidential and parliamentary elections by April 1999. He names a Cabinet composed mostly of his ADFL compatriots, names himself as Minister of Defence, and abolishes the positions of Vice President and Prime Minister. Angry supporters of Prime Minister Etienne Tshisekedi protest in Kinshasa and charge that President Kabila is beholden to the Congolese Tutsi minority in eastern Congo. Instances of brutality by ADFL forces in the capital are recorded. The 32-year Mobutu era is over. Sep 1997. Mobutu dies in exile in Morocco. Feb 1998. Although the First Congolese War is officially over, ethnic conflict continues in the eastern areas bordering Uganda and Rwanda. President Laurent Kabila bans political activity; Etienne Tshisekedi, the opposition leader and a former Prime Minister, is arrested in Kinshasa, the capital city. Mar 1998. Local villagers attack UN investigators in Mbandaka after a mass grave is discovered. The UN is investigating allegations that rebel forces loyal to President Kabila massacred Rwandan Hutu refugees in 1996 and 1997 during the war. The UN subsequently pulls the investigators from the country due to safety concerns. Jun 1998. President Kabila’s rule becomes increasingly dictatorial, repressive, and corrupt. Jul 1998. President Kabila orders Uganda and Rwanda—his former allies—to withdraw all advisors and military personnel from the Congo. In New York, the UN investigators accuse Congolese soldiers and their Rwandan Army allies of killing unarmed Hutu refugees in 1996 and 1997. Etienne Tshisekedi is released from internal exile. Nov 1998. Rwanda admits for the first time that it is providing military support to the Congolese rebels. Rwanda says this is necessary to ensure stability in Rwanda and to stop “génocidaire” Kabila. The Movement for the Liberation of Congo (MLC) headed by Jean-Pierre Bemba emerges in the north – reportedly backed by Uganda. Jun 1999. A new wave of inter-ethnic conflict erupts in northeastern Congo between the herding Hema and the farming Lendu peoples. 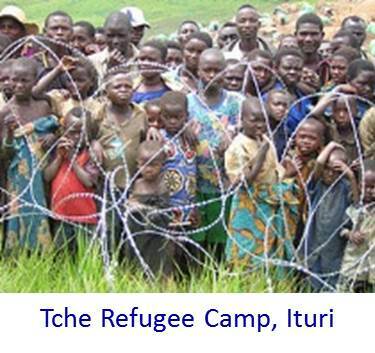 in Ituri Province. The conflict starts over longstanding land ownership and grazing disputes–exacerbated by the 1973 Land Use law, which allows individuals to purchase property that others already live on). In-fighting between leaders of the Rally for the Congolese Democracy (RCD) result in a split of the rebel group into two factions: RCD–Goma and RCD–ML. Nov. 1999. The UN authorizes establishment of a new peacekeeping force (MONUC) for the DR Congo. Feb 2000. With regional peace and security threatened, the UN authorizes 5,537 peacekeepers for MONUC, in addition to 500 military observers already sent to monitor the Lusaka Ceasefire Agreement. 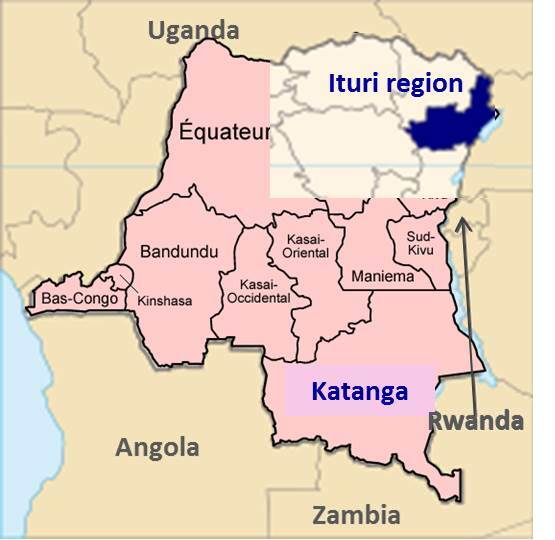 In the past 7 months, the “war within a war” in Ituri Province leaves between 2,000 and 7,000 dead and thousands more internally displaced. The Hema are supported by ‘village defence’ Mai Mai fighters who back President Kabila, while the Lendu are believed to be supported by Ugandan soldiers who have crossed the border into the Ituri region (although Uganda says its soldiers are in the region to restore security). Apr 2000. A new ceasefire agreement is signed by all parties — the Congo Government, rebel leaders, Uganda and Rwanda (who back the rebels) and Zimbabwe, Angola and Namibia (who support the Congo Government). May 2000. The Congo Government finally agrees to the deployment of the UN MONUC peacekeeping mission. Aug 2000. African regional leaders blame Congo President Laurent Kabila for the failed peace process after he refuses to accept the proposed mediator, former Botswana President Ketumile Masire, whom Kabila accuses of being sympathetic to the rebels. (Some say President Kabila’s real goal is to avoid constitutional negotiations that with all Congolese parties – including the armed rebels.) President Kabila suspends the Lusaka Peace Accord amid accusations that Rwanda and Uganda are looting the country’s natural resources. Evidence emerges that former US President Dwight Eisenhower had directly ordered the 1961 assassination of Congo’s independence leader, Patrice Lumumba. Dec 2000. Over 200 MONUC observers are deployed to the Congo to record any non-application of the Lusaka Ceasefire Agreement and any presence of foreign troops in the DRC. UN Secretary-General Kofi Anan says the remaining UN peacekeepers will not be deployed until the fighting has stopped and President Kabila has opened negotiations with the rebels. The Rwanda-backed RCD (Congolese Rally for Democracy) rebel group demands an international inquiry into President Kabila’s alleged role in massacres of ethnic Tutsis in eastern Congo. Jan 2001. 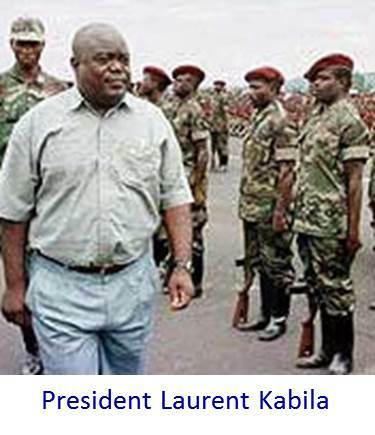 President Laurent Kabila is assassinated. 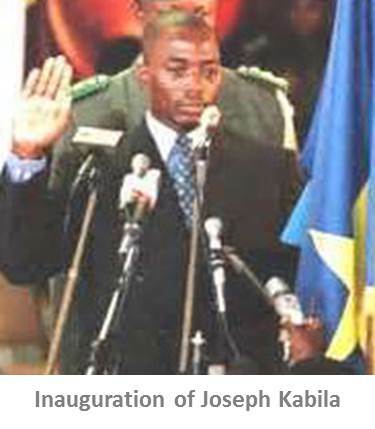 His son, 30-year old Joseph Kabila, succeeds him as president. Although Joseph Kabila does not speak the national language and is viewed as weak and inexperienced, the death of Laurent Kabila is widely viewed as the removal of a longstanding obstacle to a peace agreement that includes rebel factions. Feb 2001. The young President Joseph Kabila surprises many by undertaking a high level diplomatic tour, which included meetings with the US, UN, and Rwanda. President Joseph Kabila agrees to accept Ketumile Masire as the regional peace negotiator under the Lusaka Ceasefire Agreement. Jul 2001. President Joseph Kabila meets with Yoweri Museveni, President of Uganda, for the first time. Uganda announces it will withdraw its forces from the DR Congo as provided in the 1999 Lusaka Ceasefire Agreement. 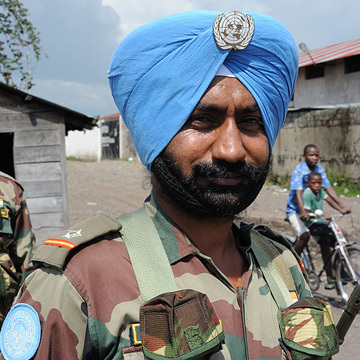 More than 2300 MONUC peacekeepers are now in the DRC. Aug 2002. After four years of war, Zimbabwe and Uganda begin withdrawing their troops from the DR Congo. Sep 2002. The Congo government expels 25 leaders of the FDLR (Rwandan Hutu rebel group) from the country. The UN welcomes the decision, but Rwanda argues that the FDLR leaders should have been arrested, and not released and expelled. Rwanda begins its troop withdrawal. Oct 2002. All remaining foreign troops (pro-government Zimbabwean, Angolan and Namibian troops and pro-rebel Rwandan and Ugandan troops) are withdrawn from the DR Congo. Nov 2002. It is reported that in Ankoro in Katanga Province, Government soldiers have killed more than 100 civilians in heavy fighting against the local Mai Mai (village defense) militia. The Mai Mai had been armed by the government during the war to help in the fight against Rwandan-backed rebels in eastern Congo. More than 75,000 civilians are displaced from their homes. Dec 2002. The Inter-Congolese Dialogue in South Africa results in a Global and Inclusive Agreement signed by the DR Congo Government and the two main rebel groups—the Rwanda-backed Congolese Rally for Democracy (RCD) and the Uganda-backed Congo Liberation Movement (MLC). The Agreement calls for a power sharing plan that keeps Joseph Kabila as president and adds four vice-presidents—one each from the current government, the political opposition, the Rwanda-backed RCD and the Uganda-backed MLC. The UN authorizes an increase in the MONUC peacekeepers from 5,537 to 8,700. Just over 4000 MONUC soldiers are now in the DRC. Mar 2003. Ugandan troops seize the mineral-rich town of Bunia in Ituri Province, as Ugandan and Rwandan proxy militias exacerbate the Hema-Landu ethnic conflict. The UN announces it will investigate reports of a Lendu massacre of 150-350 Hema villagers. Apr 2003. The aid agency International Rescue Committee describes the four and half years of war in the Congo as “a humanitarian catastrophe of horrid and shocking proportion…” and the deadliest conflict since World War II. The Congo Government and rebel groups finalize the peace agreement, which paves the way for a transitional power sharing administration until the elections can be held in 2005. The UN High Commissioner for Human Rights indicates that those responsible for the massacre in Ituri province could face justice at the new International Criminal Court (ICC). July 2003. Leaders of the main Congo rebel groups –the RCD-Goma, RCD-National, RCD-ML and the MLC—arrive in Kinshasa to take their seats in the new transitional administration, potentially signifying the end of the five-year war.